We are taking our efforts to the next level at Hinshaw as we double down on our commitment to diversity and expand our initiatives throughout the firm. We believe that a successful diversity and inclusion program requires intentionality across three initiatives—attorney development, relationship building and civic engagement. Our attorney development is aimed at making our diverse attorneys the best in their field. Our relationship building helps form bonds of trust that make our teams stronger and more inclusive. Our civic engagement enables us to be leaders and agents of change in our respective communities. Hinshaw understands that diversity and inclusion cannot be successful in isolation. Our Diversity Committee is comprised of key stakeholders across the firm—Management Committee Members, Associate Hiring Chairs, Affinity Group Leaders, Practice Group Leaders and Partners in Charge. Diversity Committee members collaborate on a regular basis to review and ensure the advancement of our three-fold Diversity, Equity & Inclusion initiatives at Hinshaw. We spoke with Pedro Hernandez, who has been with Hinshaw for almost 12 years and a partner for five. 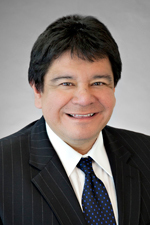 Pedro is a litigator who works on insurance coverage matters, and complex commercial and construction litigation. He told us why he's an attorney, how he contributes to his community, and what he would tell his younger self. Fun fact: what profession would Pedro have pursued if the legal profession was not an option? "An ichthyologist. I am fascinated by marine biology. Or a construction worker: if my wife would let me." What or who inspired you to become an attorney? My "why law story" is simple. It begins and ends with my wife. I told my wife in high school that I wanted to skip college and go into construction. She said that there was nothing wrong with construction, but that I would be great as an attorney. She told me that in high school and then, again, in college. The truth is that I never thought I had it in me. She did and she pushed me. Being diverse yourself, what tips would you give to young, diverse lawyers to thrive in the legal profession? I would say ignore the noise and distractions and just focus on being a great attorney. Focus on greatness. Work hard and be tenacious. Being diverse is a positive not a negative so it will work itself out. So long as you focus on being a great attorney you will be fine. What are some things you do in the community that you find enjoyable and rewarding? So I try my best to take on one pro bono project per year. One year it was helping a woman get her green card and someone in our Chicago office helped me. Another project was helping an indigent person navigate through some tough legal issues that were confidential. I also enjoy speaking with high school students from my childhood town on how to achieve success or just discuss any questions that they may have. Their questions range from how a poor minority kid can work hard and achieve her or his dream, to which schools they should consider. All of it is very rewarding to me. Be patient! But never stop believing in yourself. Also be humble and appreciate everyone who will help you throughout life and your career. Say thank you as much as possible. We sat down with Ellen Silverman and Sam Bodurtha to gain more insight on the ever-growing requests from clients for more diversity in their matters and to learn more about what makes them successful partners. Ellen Silverman is a partner in the New York Office. She is also the Chair of the firm's Consumer Financial Services Practice Group and a Member of the Diversity Committee. Sam Bodurtha serves as Partner-in-Charge of the Boston and Providence offices. Major clients are prioritizing diversity and inclusion in the firms they hire. What kind of impact do you think that has on the firm and yourself? Ellen: A large Consumer Financial Services client asked a group of us to come to their offices in D.C. to present about Hinshaw's diversity and inclusion initiatives (and pitch for their business). It was a powerful meeting. This client challenged us to think about diversity and inclusion in a new way—to show them how far we've come—but to focus more on where we are going. They made it so clear that they will not work with any firm—no matter how good—unless we are committed to diversity. And not just committed in terms of having programming. That's just step one. They want to see that we are interviewing, hiring, training, encouraging and promoting diverse attorneys. They also differentiated between women and ethnic diversity, which is an important distinction. Most of our corporate clients are demanding that we make significant changes in terms of our diversity makeup. As a firm, we need to listen to their message and take action now. Sam: Opportunity and a challenge. Opportunity because Hinshaw is in a position right now to present our clients with structure, demographics, leadership and civic engagement that demonstrate our firm's commitment to diversity and inclusion. We need to seize upon this opportunity now as a valuable marketing and business development tool. Challenge because our clients are asking, and will ask us to do more in terms of diversity and inclusion. The particular client we visited wants to partner with outside counsel in the coming years to prioritize diversity and inclusion. This sort of prioritizing includes our own review and analysis of recruiting, performance and turnover metrics, our engagement of diverse suppliers and vendors, and our sponsorship of programs that bring diverse students (from high school to college and through law school) to Hinshaw. So, while we may have laid a solid foundation, we need to build on that foundation in order to continue to thrive in this environment. What tips would you give to young, diverse lawyers to thrive in the legal profession? Ellen: Develop relationships with everyone around you. Always keep your clients and the attorneys you work with informed before they ask you. Always own up to your mistakes immediately. Try to remember that everyone comes to the practice of law with a different background and might take a slightly different approach than you. Listen and be kind. Sam: Perfect your craft first. Make sure that you are best at what you do and in whatever area of practice or practices you work. Second, market, market, and market yourself. Update your firm bio and LinkedIn page so it is both current and relevant. Write up a post for one of the firm's blogs (preferably Consumer Crossroads!) even if you don't practice in the particular area of focus in any given. Social media and digital marketing are a phenomenal means for all attorneys to get their names and faces out. It is instantaneous, it is inexpensive, and your clients, colleagues and prospective clients are all on social media reading material while at the same time hiring firms for legal work. Diversity & Inclusion go hand-in-hand. How important are allies when advancing D&I at the firm? Ellen: Allies are people who are supportive and sympathetic to a particular group of people that they are not a part of. In a law firm (or any business), allies are critical to the success of any diversity & inclusion program because—hopefully by their sheer numbers—allies help amplify the message, can break down barriers and help get the right message to those who make the hiring/promotion decisions. Sam: To me, this is just another example of strength in teamwork. In my practice and in the Consumer Financial Services Group, we rely upon team effort to handle matters, to achieve the group's goals and meet expectations, to market and to develop business. Teamwork is where we find our strength and success. Advancing diversity at Hinshaw should be a team effort as well, and that means reaching out across the firm, connecting with all Hinshaw attorneys, maintaining those connections, and creating the team effort to advance our own strengths. Most new associates at the firm are optioned to Hinshaw University (the firm's accredited in-house CLE provider) for the week-long basic skills seminar. While that seminar is geared toward and helps the new associates learn about the firm, expectations, and their future careers, Hinshaw University is the first opportunity to connect with other attorneys and to gain any ally or two (or three or four). Spencer Kook took time to speak with us about his inspirations, his hidden talents, and advice on how to become a successful attorney. In addition, he may have mentioned a little bit of his 90's fashion sense. Spencer is a member of the Executive Committee, Diversity Committee, Managing Partner of the Downtown Los Angeles office, and the newly-appointed member of the Board of Directors at Imagine Project—LA's new and only Equity theatre dedicated entirely to programming for children. As an ethnically diverse lawyer, what advice would you give to ethnically diverse law students about entering this profession? Get connected. Find ways to make connections with those in your work life. Making those connections will help bridge any differences that might exist in your working relationship with partners and your peers. Further, bonding with those you work with will help make the practice more enjoyable. As much as we may love the practice, our profession is not always an easy or enjoyable one. Being connected at work will help provide support, both practical and emotional, for those tougher times. Finally, insofar as there is an interest in professional advancement, making those connections with superiors and peers—as well as doing great work—is essential. What would be one thing that your fellow colleagues would be surprised to learn about you? I was part of a hip hop dance group in high school and I wore MC Hammer pants. No, there's no existing video footage of any dance battles. What was the best professional advice you received? Take initiative. As younger attorneys, we are very much order-takers. We move busily from one project to the next in the never-ending list of projects handed down by a more senior attorney. At some point, it is important to take initiative and determine what needs to be done on a case and suggest those action items to the partners with whom you work. The sooner you transcend over being just an order-taker, the sooner you will be trusted to handle more responsibility and become a more valued member of the firm. This advice also applies to business development. It is never too early (or too late) to take the initiative to do things that will help you develop business.